If you are a student looking for summer or seasonal work then what better job to have over the summer then working in Ibiza in one of the many bars? There are hundreds of bars on the Spanish Balearic island of Ibiza catering to the massive influx of tourists. Visitors come to Ibiza because it is known as Europe’s party capital and home of dance music and some of the best nightclubs in the world. If you don’t mind which Spanish resort you find bar work in, you can also work in Lanzarote, Gran Canaria, Magaluf or bar jobs in Tenerife. You just won’t find bar jobs advertised outside of Ibiza so if you’re looking to fix up a job in advance its going to be virtually impossible unless you know somebody who knows somebody! Head straight for the workers bars and pubs in San Antonio such as the Ship Inn and just be friendly and make some contacts and get some advice from people who are already working. Give out your number and sooner or later you may get a call back. It really isn’t realistic to think or expect that you’re going to get a job behind the bar of a famous nightclub such as Pacha or Eden. This also would apply to some of the best-known bars such as Cafe del Mar, Cafe Mambo or Savannah on the Sunset Strip where people gather in the evening to watch the sun go down. The two companies mentioned below are working holiday companies where you pay a package price for your flights, food and accommodation, as well as having access to their reps who will try and fix you up with a bar job in Ibiza. San Antonio is the liveliest resort in Ibiza and this is where the highest concentration of bars and pubs are. The West End area of San Antonio is reputed to have the highest concentration of bars in Europe. Because so many other people swarming all over the bars asking for work, you might be better going elsewhere in Ibiza such as Ibiza Town and beach resorts such as Playa D’en Bossa and Santa Eulalia. Finding cheap accommodation can be a problem in Ibiza especially if you are not out there early enough to get a long let through the summer. You probably want to look into workers accommodation in Ibiza, perhaps just sharing with other workers by renting a room. Renting a studio or one-bed apartment starts at €500 a month. Our main page on Ibiza jobs also has some good places where you can find work such as forums, newspapers, radio stations and other useful websites. Ibiza Bar Jobs – Do I Need To Speak Spanish? An ability to be fluent in Spanish is definitely not necessary in Ibiza but because the competition is so strong, if you can at least speak some basics so that you can serve drinks and give change, it will help you get the job over other people who can only speak English. Don’t forget that many other nationalities are also looking for bar work and often they have the ability to speak multiple languages so competition is tough. You can get other jobs in a bar aside from serving drinks as a barman or barmaid. There is also a need for staff to collect empty glasses, cloakroom, security staff such as door supervisors or bouncers, jelly-shot girls, laughing gas sellers, PR’s, DJs and dancers. This page will help you if you fancy looking for other types of summer jobs in Ibiza. Summer Bar Work – How Much Can I Earn? Most of the bar jobs in Ibiza are seasonal and the owners just require temporary help to cope with the peak summer demand. Bar owners are inundated with people coming in all the time asking if there is work available. Because of this they are in a very strong bargaining position and hence wages and pay are low – you have to accept it or not. The average going hourly rate of pay is five or six Euros an hour which typically is paid cash in hand. This means technically you are working illegally and you have no rights and no contract. What would happen if you are ill and had to be rushed into hospital? If you are from an EU country such as the United Kingdom and you have got the free EHIC card then you should be able to get free medical treatment on the Spanish national health system. We can strongly recommend working behind the bar in Ibiza to students looking for summer work which coincides nicely with your summer holidays. The earlier you can get out to Ibiza the better because the big clubs open up at the end of May and beginning of June so the quicker you get out, the more chance of getting a job before everybody else breaks up from term. One of the bonuses of the job is that you should get either free or cheap drinks while you work. What is an Ibiza PR Rep Job? Ibiza has a great demand for public relations reps in the summer, especially in July and August. You will see these PR reps all over the island handing out leaflets and flyers for various businesses on the island. Because there are so many bars, pubs clubs and restaurants as well as many other types of businesses, they need to fight to attract as much business as possible, especially as the tourist season is relatively short. Ibiza Club PR’s – all the major clubs such as Eden, Space Ibiza, Pacha and Es Paradis need PR’s to get more customers. If you are confident and can easily talk to strangers then you should do very well. Basic salary of between €25 and €40 a day with bonuses for performance. 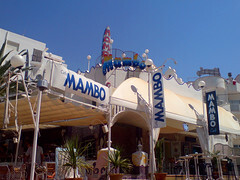 Ibiza Bar PR’s – Another easy to get job in Ibiza as every bar has at least one PR standing outside trying to attract new custom with a bit of chat or some sort of special offer. If you think you have got the gift of the gab and that you will be brilliant at getting customers into the bars find a PR job on commission. Otherwise find a PR job with a set wage of between €25 and €40 per day. Ibiza is just 79 km from Valencia on the eastern coast of mainland Spain. It means that the weather isn’t that good in the wintertime compared to the Canary Islands which are much further south. You will get a longer season in the Canaries and there are plenty of PR jobs in Tenerife, Lanzarote and Gran Canaria. Alternatively one of Ibiza’s neighbouring Balearic Islands, Mallorca, also has lots of PR jobs in Magaluf. Being a PR is quite exhausting literally. Often you will be standing outside bars and clubs trying to stop passers-by by flagging them down and attracting their attention. A sense of humour is essential and it does help to be a good-looking lad or stunning lady. Failing this, comedy helps in getting people’s attention. It also helps if you have a special offer or vouchers for cheap drinks or free shots to offer tourists. You may also be walking around Ibiza Town or San Antonio handing out leaflets and flyers all day trying to get people to come to your bar or club later in the evening. The problem with most PR’s is that it is mentally quite draining constantly talking to people and trying to be hyper and funny and basically sell to them. It is also pretty frustrating seeing everybody having a great time when you have to work for very low pay. After just a few weeks most PR’s have given up and joined the holidaymakers in partying! At first you will probably find that there are lots of workers and few guests and not enough jobs to go around for everybody. But at least if you are early you can make lots of contacts, get to know people and as soon as a job becomes available you are likely to get one. In all honesty these PR jobs are easy to get at any time because if you’re no good employers will quickly get rid of you. Late August is also really good time to come out and get a job because many students have to return back to university or college leaving many vacancies. The summer season in Ibiza tends to start around mid-May to early June when the major clubs open up with their famous parties. For DJ jobs click here. Most PR work can be found in San Antonio, especially in the West End area which is packed with bars, pubs and restaurants. Often you will just be standing outside in the street trying to attract people’s attention or during the daytime you might be walking about San Antonio especially the beach front. Other PR work would be in the capital which is Ibiza Town, a couple of the big clubs on the side of the island including world-famous Pacha and Space. You can also find PR jobs in the popular family friendly beach resorts of Playa D’en Bossa and Santa Eulalia. You will be working even on pure commission or a very basic salary plus commission. Being able to pay your way through the season depends on you getting results. You have simply got to get customers into the bars and clubs which you are promoting for. If you can do this you going to earn about €30-€40 per day and if you are no good your boss will quickly fire you as there are plenty more people waiting for your job! Most PR work will start in the evening at around 7 PM and you could be working until 3AM. Although the pay is low there are some additional benefits in that you normally get discounts into the clubs and sometimes free admission, as well as cheap or discounted drinks in the bars. It helps to be a handsome man or beautiful, stunning woman but the most important characteristic is some personality and attitude. You need a positive energetic character and you need to be able to make people laugh. If you are charismatic and bubbly a PR job is the perfect job for you. You could actually earn a lot of money and have lots of fun at the same time. If you are from the European Union you won’t need a visa to work in Ibiza, Spain. Generally you also won’t need an NIE number because most PR jobs are not on official contracts and are paid in cash. Usually each bar employs one official PR on a contract so it doesn’t look suspicious. The rest are paid unofficially and illegally in order to save on paying extra taxes and social security contributions. Most people get PR jobs just by asking around. It is rare to see these jobs advertised, just get to Ibiza and start asking round at the bars and clubs and you will soon find people willing to hire you. A job that is very much related to PR is working as a person flyering or postering in Ibiza. This is another form of promotional work. Working as a PR very much depends on having the gift of the gab and being able to converse with people in order to persuade or sell to them. Instead a job involving giving out flyers or putting up posters in Ibiza is great if you’re not so good at conversation or talking. This job is incredibly important because the clubs need to promote their special club nights and events. As well as giving out flyers to passers-by there is also the job of putting up posters on billboards and in frequently seen locations such as noticeboards, hotels, restaurants, shops and bars. It can be quite a frustrating job seeing your poster being covered over by another poster for a completing club. Your employer will want to see your posters being displayed all over the island, otherwise they think you haven’t done your job properly or at all and you will be fired! A person doing a flyer job or posterer job In Ibiza will usually be expected to earn around €40 a day and be paid cash in hand. You also have an additional benefit of being a worker in Ibiza gaining free admission to clubs. It is pretty wild and fun. It’s quite an easy job to get. Although you are paid commission you can earn a lot if you are good. Reduced admission to the major clubs as a worker. You can have some time off to enjoy the island. Long hours and very tiring. Burnout! Pay tends to be low and commission only. No accommodation or meals included. No contract and no entitlement to Spanish health system. Candy gives her advice on how to land a job in Ibiza, wise words from someone who’s been through it all! We encourage companies looking to employ bar staff on Ibiza to list your vacancies for free below and if you are searching for bar work you can also leave your situations wanted and your contact details below in the comments box. For a full index of pages see our get work in Spain main section. What I hope to find is a place to work and enjoy with a group of professionals to share a lifetime experience!! I have travelled extensively for the past 2 years To Zante, Ibiza and Gran Canaria. I’m out on holiday for 2 weeks in September from the 9th in Playa D’en Bossa. I am multi talented as a DJ, Roadie, Customer Service, Office Admin (Civil Service 14 Years). I started at the World Famous Asian Radio Station called Sunrise Radio 1458am in Southall. I then moved to play House, 70’s and 80’s and most other Genre’s with Playaz DJ Agency in Clubs, Corporate Events/Private Weddings and Functions. I am a natural people person and already established myself at Stevie D’s Bar in San Antonio (Cala De Bou) last year in May. One of their staff (Lisa) gave me the name Harrie Innit! I am basically looking for any type of work as a stepping stone. I am flexible and free due to Redundancy from the day job. I receive 260 DJ Promo’s a week from various DJ lists including King of Spins, MoS/Data, Power Promotions, The Play Centre, Soul Food (Music House). I also play Bhangra Bollywood. I have worked alongside various BIG Names on the Radio as a Broadcast Assistant. I have also helped to launch Internet Radio Stations. I started Dj’ing in 1994 and run my own Roadshow from 2000. I am looking to work abroad and look forward to my next adventure in life! Thank You, Kind Regards. Hi there how you doing? I’m just writing to see if there’s any pr jobs going. I’m very hard working and will put a lot of effort in. I get along with people so o think this would be an advantage. Kinds regards. I m looking for any kind of DJ work going. I have been DJing for the past 3 years and i would love to get the opportunity to play here. I play a variety of music: , COMMERCIAL, HOUSE , DUBSTEP, ,ELECTRO, DNB, HIPHOP and many more Genre.